This rare marine model is made with a cast red brass case, key locking bezel and employs an original E. Howard Clock Company #69 movement. This is a time-only movement with an eleven jeweled escapement and E. Howard moon hands. The movement is nickel plated and heavily engraved throughout. The original hand-silvered brass dial features Arabic numerals in a design unique to Ashcroft Mfg. Co., and is custom engraved with the words “Henry R. Worthington New York”. 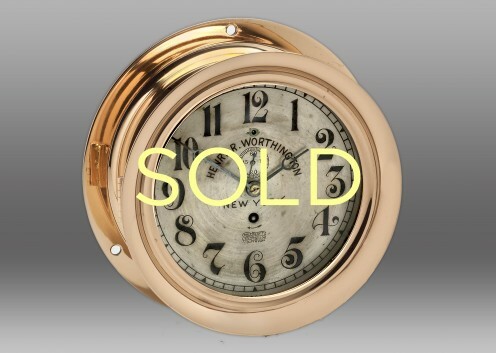 The clock’s case features a locking bezel with key. Approximate date of manufacture is 1902-1907.